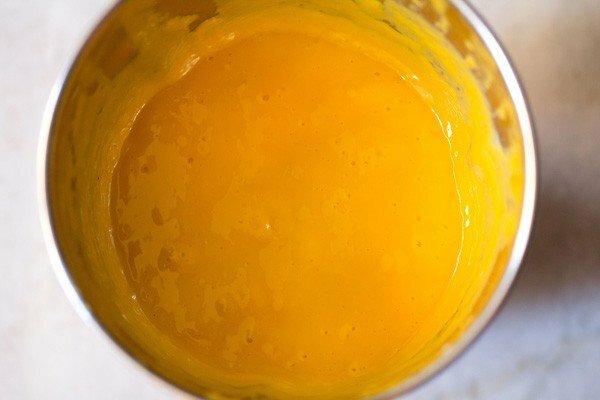 Punjabi Mango Lassi Recipe - Thick, smooth and delicious mango lassi recipe. 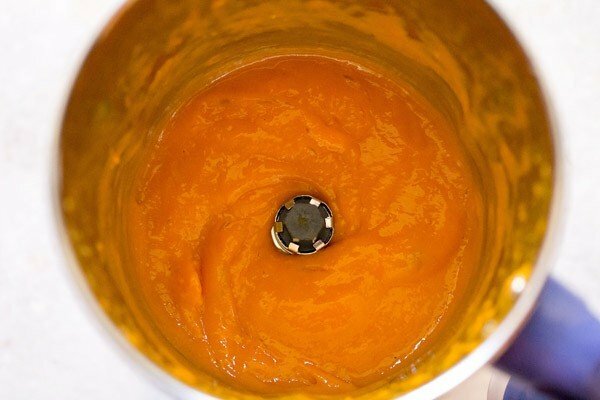 Mango Lassi Recipe with Step by Step Photos – Thick, smooth and delicious mango lassi recipe. 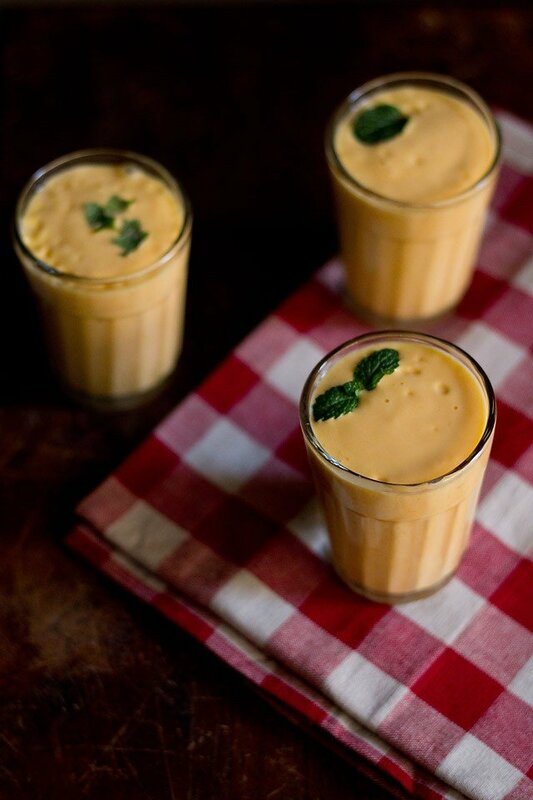 I make Mango Lassi and Sweet Lassi often to beat the heat during summers in India. 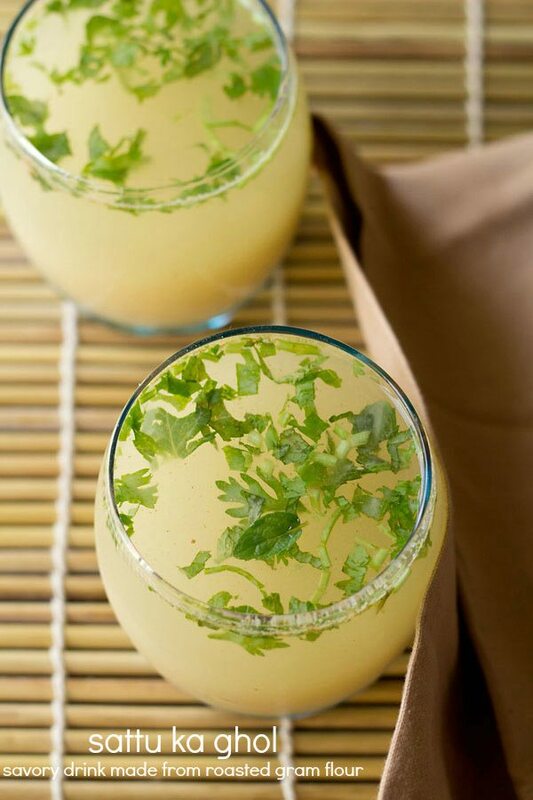 Apart from punjabi mango lassi, I also make Shikanji (Indian Lemonade), Aam Panna (Raw Mango Drink), Kokum Juice and Buttermilk Recipe often. All these beverages are cooling in nature and are good during the hot Indian summers. The months of April-May are the hottest and many summer drinks and coolers are made here to quench the thirst and also to cool the body. April-May is also the season of mangoes in India. One can buy different varieties of mangoes in this season. I have added some low fat cream in this recipe of Mango Lassi. You could skip that. Secondly, I have used ice cubes too. 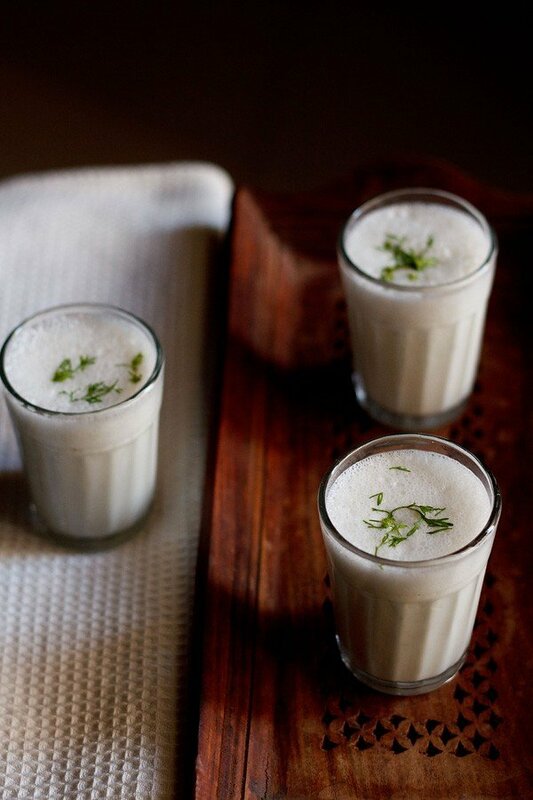 The flavorings for the lassi can be rose water or cardamom powder or saffron strands. You can choose any one of them. You can also avoid these and keep the mango lassi plain and simple. 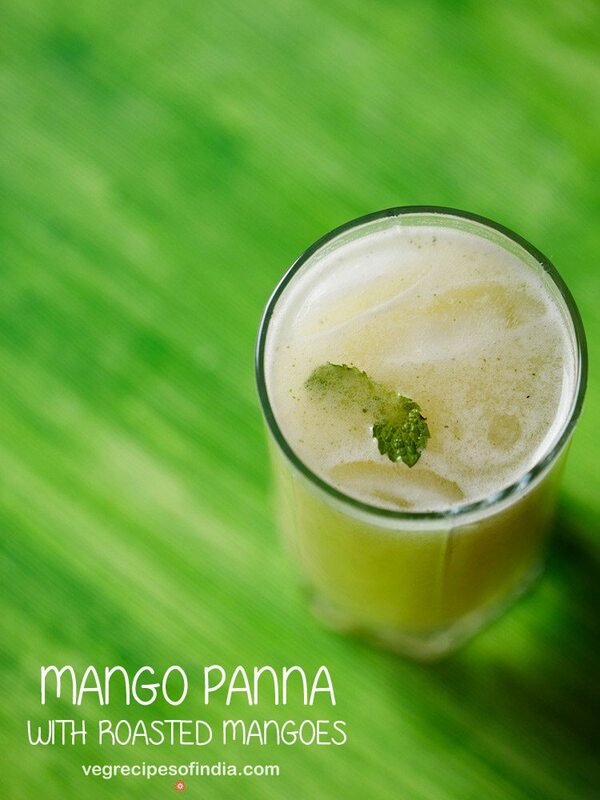 The color of the lassi will depend on the variety of mangoes added. I have updated the step by step pics with lassi made from alphonso mangoes and hence the color is different from the final lassi pics, which were made from a different variety of mangoes. Whichever variety of mangoes you add, just ensure that they have a smooth pulp and are not fibrous. 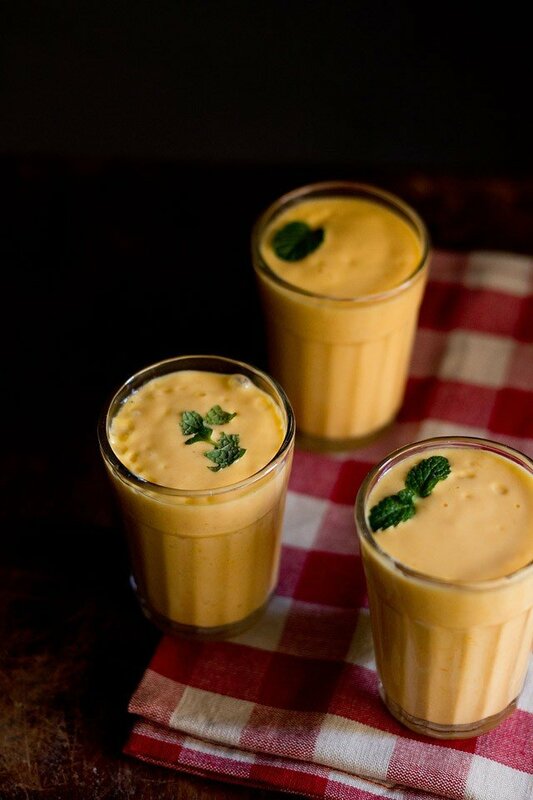 So have a refreshing Mango Lassi to keep you cool this summer. 2 cups of fresh chopped mango pieces, about 3 to 4 medium sized mangoes. I used alphonso mangoes, but you could use any good variety of mango. You could also use mango pulp. Now add the chilled curd (yogurt) and cream. 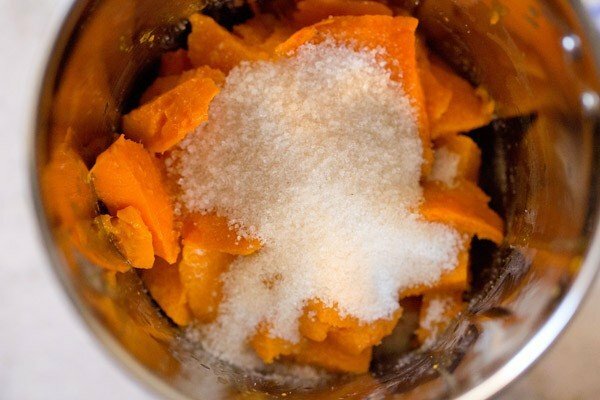 instead of sugar you can also add jaggery or honey. 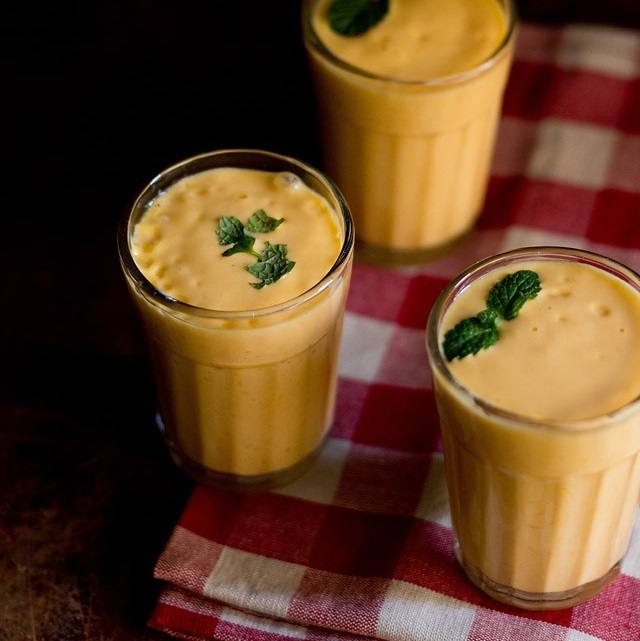 this mango lassi recipe can be doubled. 2. Add flavorings of your choice. 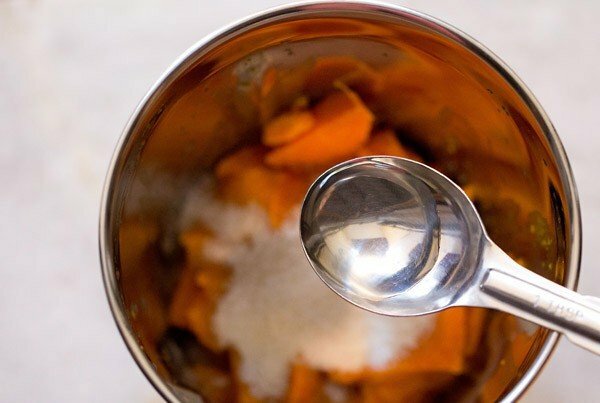 You can add cardamom powder or saffron strands or rose water. I added ½ tbsp rose water. 4. Then add 2 cups chilled curd/yogurt and 2 to 3 tbsp low fat cream (optional). 8. The Mango Lassi can be served immediately or you can garnish with some mint leaves or chopped mangoes or sliced dry fruits if you want. 9 . Enjoy Mango Lassi. Can You show the vegan version of this which will taste equally good ? heena, for a vegan version you can use cashew curd or coconut milk curd. even almond curd can be used. i have made lassis with cashew curd and it tastes equally good. cashew curd recipe is already shared on website. 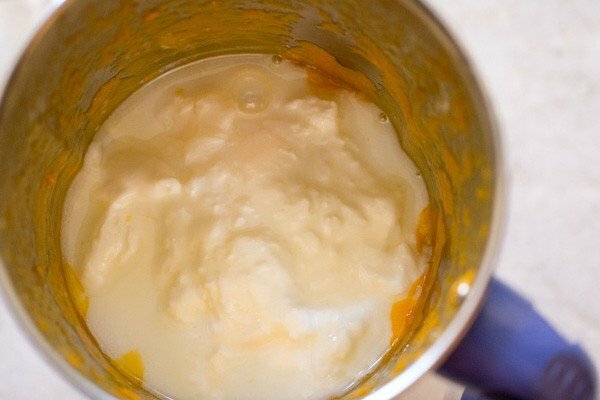 similar way you can make almond curd. for coconut milk curd, you can check on google or youtube as to how it is made. i have never made, but i know a few folks who use coconut milk curd instead of dairy curd. Followed this recipe last night. And to my utter wonder it turned out to be an unforgettable one. Used Himsagar mangoes instead of Alphanso though. Thank you. thanks anindya for sharing this. any non fibrous variety of sweet mangoes can be used for mango lassi. Can I use the canned alphonso pulp from the indian stores…and how much should I use? Any idea of the expiration date of these canned mango pulp too? Also,your recipes are very good. I often come here to get good ideas. the mango pulp should taste like mango pulp. if it has a tinge of bitter taste or has an off rancid aroma, then avoid. i have no idea about the expiration as i generally do not use canned mango pulp. 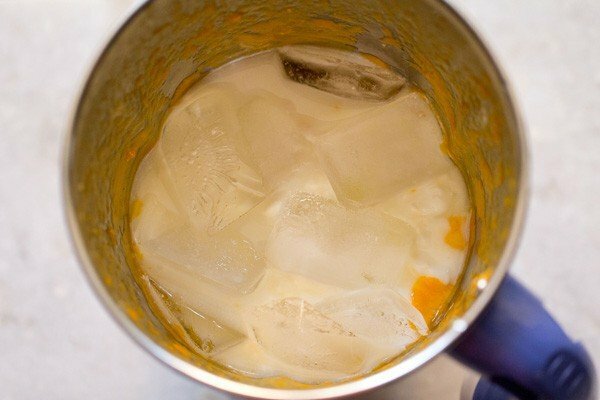 you can add 1.75 to 2 cups of mango pulp. you can also add more if you want. it should be 5 Stars! I m gonna try to make mango lassi today but I have one question is that I don’t have any kind of cream. So it’s necessary to use cream. But I have sour cream I don’t if I can use that. Also is that do we have to use only one item like cardamom, rose syrup or saffron or can we use all of them. Which one is best to use. I am really big fan of mango and my son love mango lassi so I hope he like it. Thank you for this recepie. you can skip the cream or malai. avoid adding sour cream. the flavorings cardamom, rose syrup and saffron can be used all together or you can just add one of them. cardamom goes well with mangoes. It’s a warm day here in Oakland, California and I had a mango that needed to be used. This recipe fit the bill. I used evap milk instead of regular milk and reconstituted it with 1 cup of ginger ale so no need for added sugar. It was plenty sweet but not too much. Just the way we like it. Thanks for this excellent recipe. I’ve tried a bunch of your other recipes but have to comment on this. I’ve learned so much about making real Indian foods from your site. Every recipe is well explained and clear. The photo instructions is a great idea and really whets the appetite. Thanks for all your hard work. welcome charlie. glad to know this. thanks for sharing your variation and positive feedback on recipes. welcome ellen. next time try with fresh yogurt. the taste will be better and sweet. 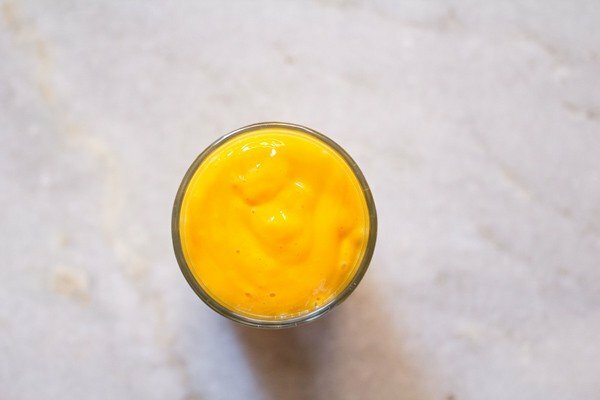 I’ve been comparing this Mango Lassi Recipe with your Mango Shrikhand recipe. Since both recipes use the same ingredients, in your opinion, what makes these recipes different? Do you have a preference to either one? welcome jessica. both are different. in mango shrikhand the whey from the curd is drained out. so what you get is the thick hung yogurt without the whey. taste wise and consistency wise both the recipes are different. 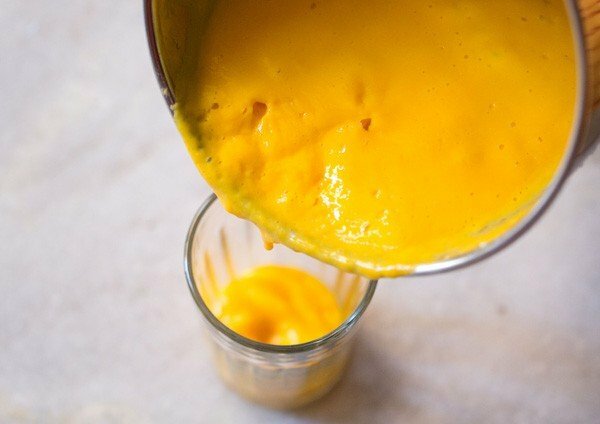 mango lassi is quick and shrikhand takes time but worth the effort. in the end both are delicious and have their own unique taste and admirers. Delicious! So refreshing and I love the cardamom. Great recipe! 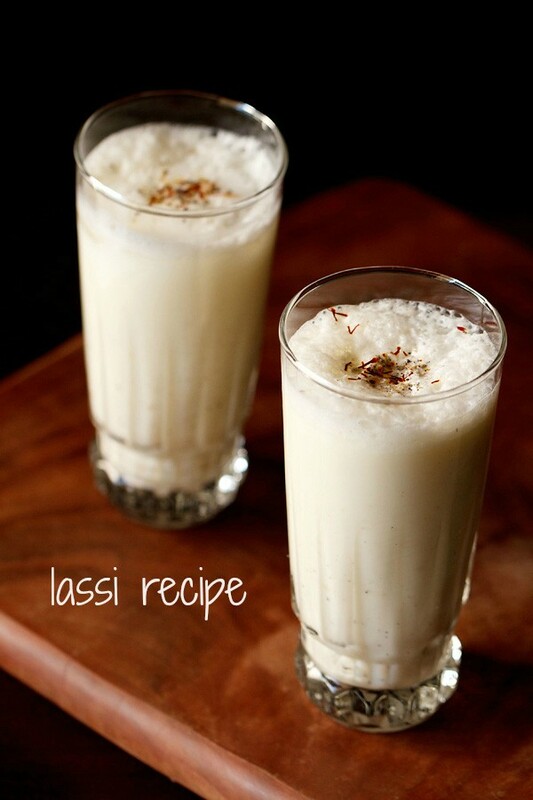 You mentioned Salty Lassi’s, so maybe you could add a section on the variations for the proper balance for a salty version. Thanks for your delicious postings! sean, i will write a post on salty lassi in future. 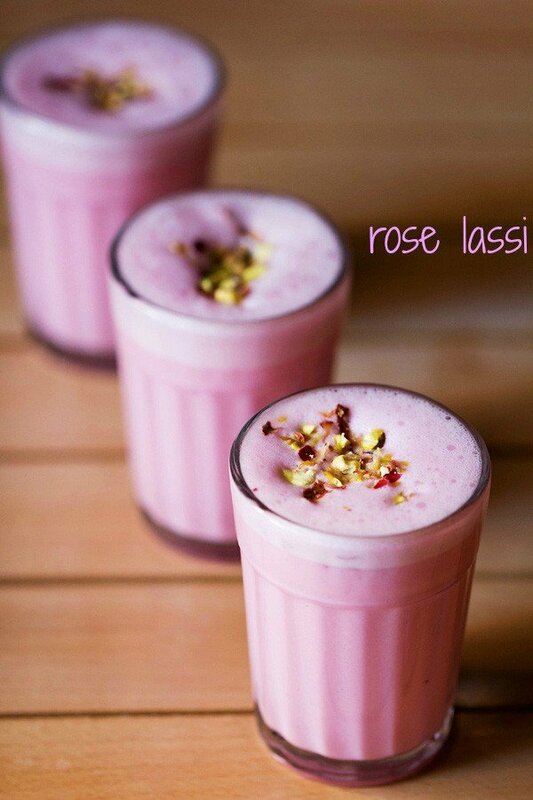 I’ve never used rose water in lassi before but it sounds to be a great idea! I’ll taste the difference nest time I prepare lassi. 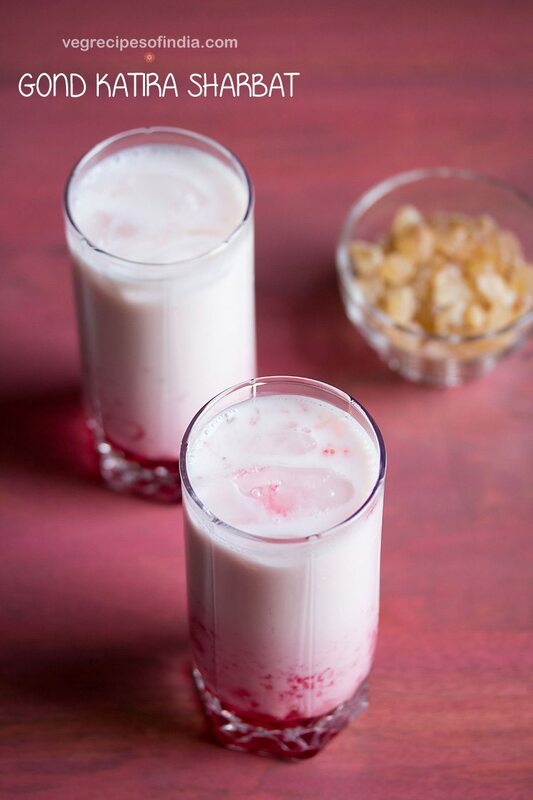 does give a light fragrance of rose in the lassi.